I'm currently researching soldiers of the 40th Battalion AIF in the first world war for a website I've got some students working on. In F.C Green's book "With the Fortieth" he recounts the story of a Pte Kelty MM, who had lost a leg, & was supposedly torpedoed & rescued from a hospital ship sometime between July & September 1918. I had a quick squizz at your website but didn't see any likely ships, are you aware of any? In 1918 three Hospital Ships as far as I am aware were torpedoed. None of these three look likely candidates for carrying your Private Kelty MM, and do you have any initials for him please? 2. Glenart Castle on the 26th. of February 1918. 3. Llandovery Castle on the 27th. of June 1918 by U-86. But this ship was used by the Canadians and was sailing from Halifax back to Europe. The Llandovery Castle was later assigned to the Canadian forces and adapted as a clearly-marked hospital ship. On a return voyage to Europe from Halifax Nova Scotia, she was torpedoed on 27 June 1918 by German submarine U86 off the coast of Ireland in one of the most nefarious incidents of the War. Helmut Patzig, the commander of the U86, was convinced she was carrying munitions, but finding no evidence, decided to shell the survivors' lifeboats in an attempt to conceal his breach of international convention. 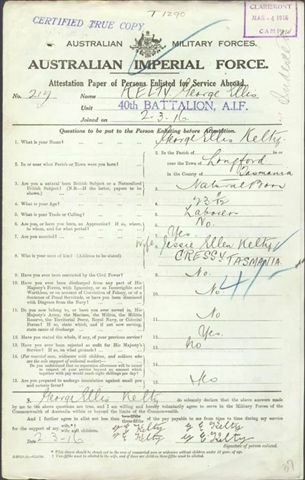 Here are the details of three Kelty AIF soldiers in WW1. They all enlisted at Claremont. It looks as if they were all brothers, they all served in the 10th. Infantry Brigade, in the 40th. Battalion and in A Company, the three sailed from Hobart on the 1st. of July 1916 in HMAT Berrima. I believe they were all brothers and sons of James and Harriet Kelty of Longford Tasmania, only George was married, to Jessie Ellen Kelty from Cressy. George was killed in action on the 7th. of June 1917, William won his MM on the 20th. of October 1917, and I will E-Mail his citation for his MM separately. Mervyn was killed in action on the 28th. of March 1918. 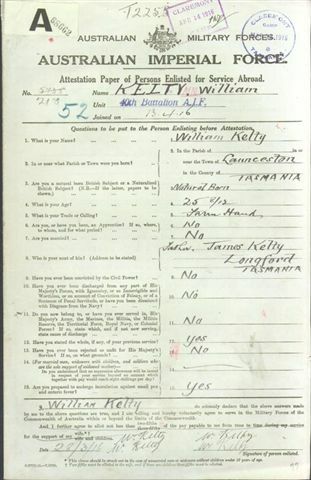 William Kelty MM is shown in the AWM records on the 30th. of June 1918 as R.T.A. that stands for Returned To Australia, so perhaps the story about his being torpedoed over July/September 1918 is just a myth, I could find nothing about such an episode. I will E-Mail the three Kelty records separately. 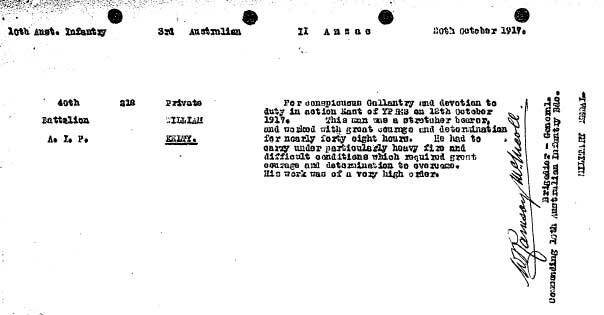 Guess that is about as far as I can go in trying to assist you with regards to Private William Kelty MM. Thanks for the info and attachments, here's the excerpt from Green's book regarding Pte. M.W Kelty. M.W. Kelty's story was incredible enough without the addition of the torpedoing episode! I'm thinking of putting the whole book online (as it's out of copyright) and might add the comment I've added below. The other error was that Green in his book referred to him as SN 108, whereas his papers show it was in fact 1008. Thanks again and thanks for the efforts on your website! incident. As they were looking at the body it was seen to move, stand up, and stagger towards our line. It was then seen that he was an Australian. After going about 20 yards he collapsed, and an officer of the 39th Battalion jumped over the parapet, ran into No Man's Land, picked him up, and carried him in. At any other time this would have been suicidal, but owing to our heavy continuous bombardment of the enemy trenches prior to the attack at Messines the enemy sought shelter in his concrete dugouts during the day, and seldom appeared. Pte. Kelty was found to be severely wounded in several places, but gave a coherent account of what had happened. He recovered from his wounds, and rejoined the Battalion, but was wounded again at Morlancourt on the 28th March, 1918, and lost a leg. He was sent to Australia, but the hospital ship he was on was torpedoed and sunk. He was rescued from the ship, and finally reached Tasmania. This is in error, Sn1008, Pte Mervyn William Kelty was KIA on this date (28th March 1918). the soldier who lost a leg and was allegedly torpedoed en-route to Australia was Sn 218 Pte William Kelty MM, brother of Mervyn William. It appears that the "torpedoing" episode has no basis in fact. Green the author of The 40th. Battalion has it all wrong, 1. 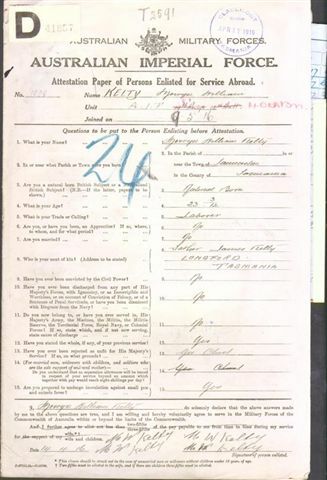 Official Number 218 Private William Kelty was the one brother of the three who survived, he won the Military Medal in 1917, and was returned to Australia in June of 1918. I do not know if he lost a leg. 2. Private Mervyn William Kelty Official Number 1008 was killed in action on the 28th. of March 1918. 3. I believe the story of the torpedoing is a myth.